Schmucker’s is a cool little place to get fresh produce and homemade Amish goods in New Haven, Indiana. This farm also has a nursery with plenty of flowers and vegetable plants for sale. I decided I wanted to plant some green bell peppers in the garden we have in our backyard. I drove over to the farm and picked up a tray of six plants. The pepper plants are now in the garden waiting for the nutrients they need to grow! In the past our garden has had a variety of things including tomatoes, green peppers, carrots, radishes, baby watermelon, and many more I can not recall as I was a little kid in the prime of our garden days. When I have a place of my own, I am definitely going to have a big vegetable garden! This place is not too far away from my house at all. I fancy the idea of biking over there while out riding and grabbing a fresh apple or other fruit of the sort! Yesterday evening I participated in something call Trek the Trails. Every Tuesday people meet up to go for a bicycle ride on Fort Wayne’s Rivergreenway Trails. It was a pretty cool sight to see everybody out and about on their bicycles. These rides last no longer than 10 miles at a time. It is somewhat of a slow-paced ride. I think most people like to take in the nature scenes. I do as well, but I think I can do it riding faster than 8 mph… There were some points where there was enough room to overtake the riders in front of you. I believe the front of the pack is the place to be if you want to ride a little faster. About halfway through they stop and take a short break and let everyone catch up. I took some video clips of this ride and put them together. Enjoy! Thanks to a photo contest put on by IPFW’s newspaper, The Communicator, I won two tickets to the Godsmack, Staind, and Halestorm concert at the Allen County War Memorial Coliseum. 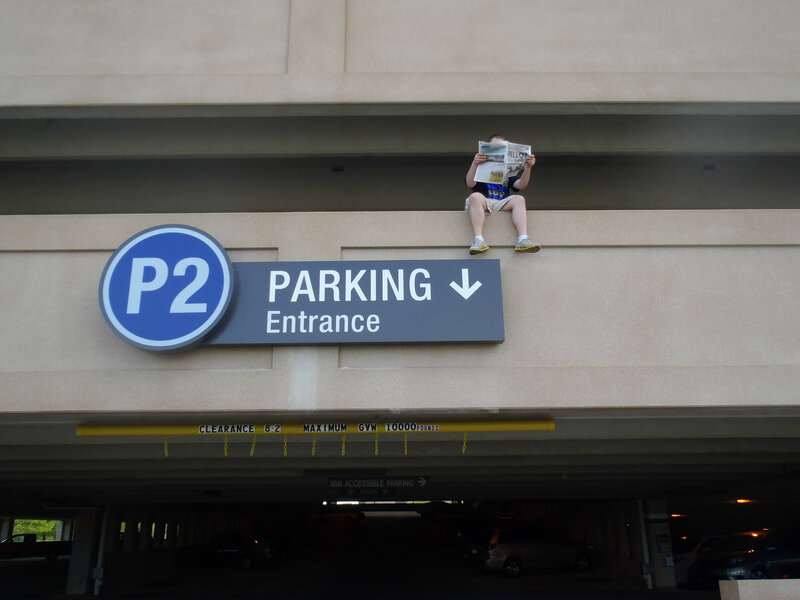 The contest was to take a photo of yourself reading this newspaper in a strange place. I submitted a few great pictures that my sister helped me capture. That picture was the best one out of the group, I thought, and apparently the staff did as well. It took a few days to pick a winner, and there were not too many submissions by other people. I was looking through other submissions and, without trying to be biased, thought mine was most strange or outrageous I guess you could say as well! I went to pick up my tickets and I was so excited!